Third Annual Veuve Clicquot Carnaval at Museum Park on March 4, 2017 in Miami, Florida. 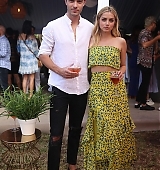 Public Appearances > 2017 > 04.03 Third Annual Veuve Clicquot Carnaval at Museum Park on March 4, 2017 in Miami, Florida. Since we’re running a little slow on news, I have added a few pictures of Ana with fans around the globe. Added 3 new images of Ana while she was in Cannes! Added three photos of Ana in 2013 while she was in the spanish market of ‘Las Cucas‘!